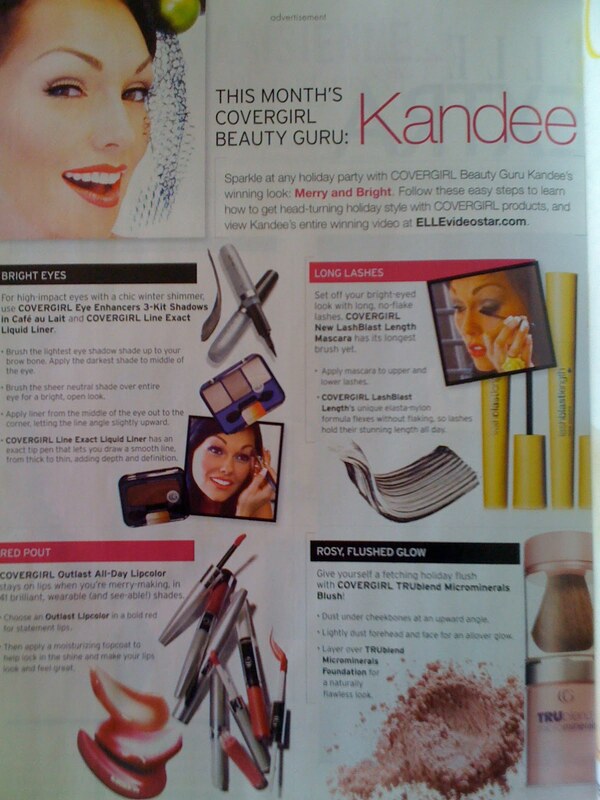 kandeej.com: I'm in a covergirl ad!!!!! 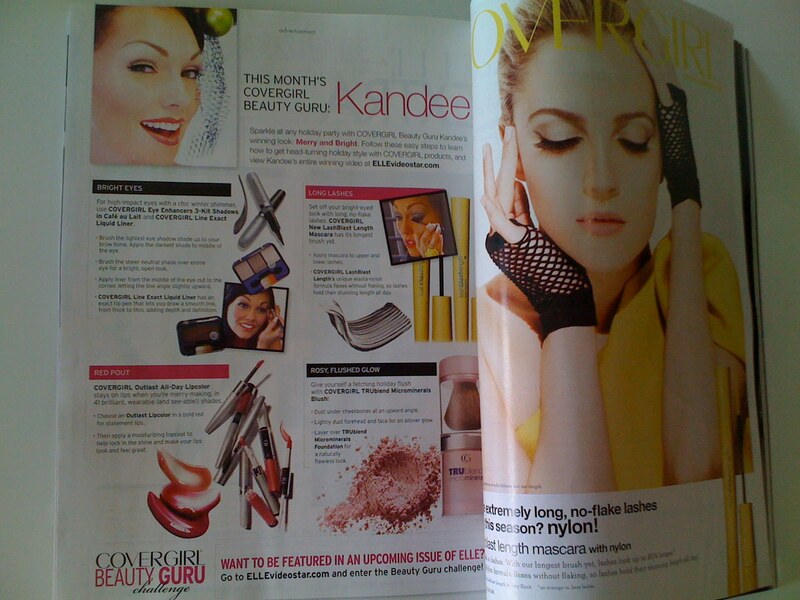 I knew I had won the CoverGirl contest...but I hadn't seen the ad, and i didn't know when it would come out! I was so excited...and my name was printed all HUGE...Kandee!!! And I'm right next to DREW BARRYMORE, in the magazine!!! I love her! I can't believe I am in a magazine, right next to Drew Barrymore!!! Maybe she'll even look at the page with me on it!!!! Oh my GOODNESS!!!!!! I am so, EXCITED!!!!!! I am so excited!!!!!! I'm in Elle, magazine!!!! (For December!!!...) yay!!!!!!!! Okay....I'm going to go back and stare at the page some more, ha ha ha ha, just kidding! CONGRATS kandee, you deserve every amazing thing that happens for you! You look so nice too! Congratulations Kandee! You deserve it! Congrats Kandee! How excited you must be! That is so awesome, and such a surprise! You are truly an inspiration and deserve every bit of the good life! weeh. . finally youre on the page of elle mag. .
am so happy 4u. .
kip yourself being nice and of course being QUIRKY. .
u wil always be in my heart. .
That's wonderful =) You completely deserve it and everything else good that comes your way! Congratulations!!! So excited for you! Truly inspiring. CONGRATS KANDEE!! IM SO HAPPY FOR YOU!! Congratulations girl! What a great feature, and next to Ms. Drew Barrymore!!! Thanks so much for posting! CONGRATS! That's awesome, and you deserve every bit of it! KANDEE you are taking over the world! Keep working hard and you will CRUSH IT! i must meet you in person bcoz in my perspective "BIRDS WITH THE SAME FEATHER, makes a beautiful feather gown". .
maybe after i graduate as a nurse. . I'm going to go and buy it myself!! Congrats! I'm going to buy one now. You rock! Congratulations Kandee!! !, you deserve it big time! 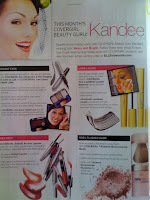 Congratulation Kandee...you deserve the best!!! More good things will come for you, just keep putting God in your life & you will be bless in more ways then you know. Best of Luck!!! Congratulations Kandee! You most definately deserve this! I hope I can still find that issue at the store! Sooo proud of you :) You totally deserve the ad! Kandee Congratulations!! Just you wait...this is just the beginning! All those years of waiting...all the tears and all the stuff you lost is all coming back to you ... some 30, 60, 100 fold...because of what you have sown ...your time, your talent and your treasure (give and it shall be given unto you good measure pressed down shaken together and running over...) it has not gone unnoticed. Get ready!! Congrats!! I'm so happy for you! I would be like super happy too if I saw myself in a magazine. lols. Congratulations Kandee! We all know how hard you've worked for your accomplishments and you deserve it! Going to buy this issue just for YOU haha!! You definitely deserve it, and you look so beautiful in the ad! Very magazine-worthy. You are such an inspiration! Your beautiful fun optimism-filled posts and videos definitely make my days better and happier, so I hope you have a lovely day as well! Congrats!!! I was so excited when I picked bought my magazine last week and saw you in it!! I screamed, "OMG!! That's Kandee!" lol You SO deserve that! You're so awesome!!! 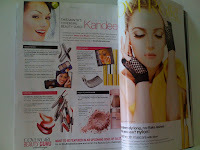 i bought the magazine kandee! i think u look very pretty and happy in that ad!!! i'm saving this copy! I don't you if you gonna see my comment here but i'm writting anyway ! First congratulations for the magazine, you're really an make-up artist ! Second I always follow your blog and see your make-up videos..so I put your pin-up look video in my blog...I have a fashion blog about the last trends of fashion..and i did in few days before about the pin-up look and i put your video ! If you want to see my blog I 'm gonna be happy ! I hope you understand what I mean.. OMG...I ran to get the issue that I just got in the mail...and yep, THERE YOU ARE on pg 262! How excited you must be Kandee, that's so freakin awesome! Congrats! Kandee, you seem so genuine. I'm so excited for you and your success. ive been watching alot of make-up tutorials and i think that yours are just the best! congrats on the elle magazine ad!! Good luck to you, chickie!! You are an awesome person!! Congrats!!!! That is so awesome!!!!! Congratulations Kandee! You are an amazing artist and the sweetest person in the world. I've learned so much from you! You deserve it! Whoa! I love Drew Barrymore...2 of the my favoritest peeps in the whole wide world are next 2 each other and in my fave magazine!!! Im gonna buy a another one just to show my support and get u even more noticed by mag sales!!! Whoo hoo!! Congrats, Kandee!! You deserve it girl!! Going to get this ELLE mag RIGHT NOW!!! Well done girl!!!!!!! waaaaaaahhhooo.. you look absolutely stunning..
AWWWWWWEEEEEEEESOME SWEETHEART!!!!! Congratulations!!!!! I think you should really get your own column in the ELLE magazine! *squeal* that is so awesome!! You deserve everything that is happenning to you, lots and lots of good things! Love from Spain, we also admire you in here!! !